"...by connecting them to other people, by having them be a member of this close group, and by giving them a sense of a more positive future, and by using peers who had been in the same situation and were telling them, 'Here's what I was then and here's what I am now, and you too can change,' they found that this was very effective." I couldn't help but make the connection between these programs and what goes on in the tight-knit group of educators using social media. We learn about tools and practices and we get ideas from other educators by being part of a like-minded community of educator with whom we can share our experiences. We can also take this idea to heart when trying to figure out the best way to get other teachers on board with social media and technology integration. Education isn't enough. Perhaps they need some old fashioned peer pressure. When the story of Natalie Monroe, the "Teacher Blogger" broke earlier this year, it rustled a lot of feathers. There were those that stood in firm support of her 1st Amendment rights, there were those that called for her to be fired immediately, and there were those that denounced the idea that teachers should be blogging at all. My opinion was pretty much in line with that of Principal Chris Lehmann here in Philly. But this post isn't about the article at all. Well, it's not about the content of the article. What struck me was the comment area. Now, comment areas are renowned for being minefields for expressing everything from well thought out replies to anonymous rants and attacks. What was new for me was that this rarely happens on my blog or on those of my 25+ good friends who blog. When it does, the blogger attempts to keep the discussion civil, and if unsuccessful, thanks the person for their opinions and ends it there. When I read some of the comments on the article, I couldn't help but think that they are a perfect example of why social media and blogging should be taught in schools! Lesson #1 that I teach to my students is that once you click "Post," "Send," or "Submit," your comment may exist forever. Even if you take it down. Lesson #2 is already explained pretty well above--don't say anything that you wouldn't say if you were standing in front of the person. It is all too easy to hide behind a screen name and say whatever you please without considering the consequences of your words. Lesson #3 is 'stay focused'--if you're leaving a comment, make sure that you stick to the topic at hand or your comment is pretty much worthless. I'm not afraid of disagreement when it comes to ideas, in fact, I welcome them (when they are presented in a thoughtful and respectful way). It is important, however, to know how to handle disagreement when you can't hear the tone of voice behind them or you're not sure if it is a personal attack. Lesson #4--don't engage 'trolls' or bullies. I teach this to my students so that they know how to handle the ever-feared 'cyberbully.' Included in that lesson is how to report the user or block them. With more and more stories coming out about students being bullied and about regretful Facebook postings and tweets, it's now or never with this up and coming generation of kids. Now, imagine being taught math by a teacher who was not allowed to multiply. Imagine the difference between being taught writing by someone who is certified in teaching writing and being taught writing by someone who is certified and has also written a novel...which would you prefer? That said, we should also be teaching them how to use blogging as a reflective platform, not a place to rant and attack others. Who will work to challenge the next generation to break through the divisiveness and the negativity we see so much in today's society, especially when it comes to civil discourse on the web? As more and more writing is done online, who will guide students if not their teachers? 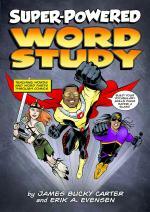 Recently, I was lucky enough to get my hands on this fantastic book, Super-Powered Word Study. The main characters of each short comic are named after a Latin root (prefix or suffix) and the stories are deliberately interlaced with context clues to help scaffold students' understanding of the roots. Activities include word sorting and scavenger hunts within the stories as well as a final piece requiring students to craft their own stories using the roots themselves. Each comic spans a week and follows the natural progression of building understanding through sorting and categorizing words through the application stage at the end of the week where students get to show what they understand by using the words in a new way. In addition, understanding word roots will aid students in understanding the meanings of new words of all kinds that they may come across in the future. I gave a copy to the sixth grade teacher across the hall and she reported that a few students snuck it away from her desk to read! The book includes a CD that contains interactive comic-building software and pdfs of comics. You can listen to a free webinar with the authors here. I have a free copy to give away to the commenter with the best story about why their students will benefit from learning through Super-Powered Word Study! The comment with the most 'thumbs up' votes by Monday, March 14th will win the book! My 6th graders are in the middle of building wikis about a topic of their choice. It has been a journey of learning how to evaluate sites, how to locate information, how to bookmark sites using Diigo and take notes with the highlighting feature. They have learned how to create a wiki and plan out their front page, and they have had time to explore editing wiki pages. Before we began building I had them plan out their site on paper using a template that looked like their wiki. However, as my students were building their sites I began to realize that they were putting all of their information on the front page. It was time to talk about pages and navigation. We spent some time looking at websites and locating the navigation and discussing the purpose of navigation. We looked at the titles of pages and discussed why the titles had been chosen and whether they were helpful or not. Back to the wikis and they still didn't get it. I then asked a second student who I knew was researching an individual, to provide his topic. Since many of the students are researching famous people, it was imperative that we do a similar exercise with such a topic. The second student provided his topic and his chapter titles. It clicked. The students were then sent to their seats where they used pencil and paper to draw out a map of their book title (their topic) and the chapters. Most of them were bent over, intently listing their chapters and building their map. The real proof of comprehension will come when I see them again on Friday, but I am fairly certain that they will be ready to start building their pages.